When I introduced my Simple Strawberry Rhubarb Pie, I gently touched upon my pie-baking challenges. Well, there is a back story, and I think it’s time to delve a little deeper into that subject. Although the memory still stings, it’s my duty to share this humiliation with others. Perhaps those who are similarly challenged will take comfort in knowing they are not alone. The setting: Early ’90’s, Hawaii, Thanksgiving. After maintaining a long-distance relationship with Jeff for 17 months, I moved myself from San Diego to Hawaii to figure out just where this relationship would go. Jeff was a young submarine sailor stationed on the USS Helena out of Pearl Harbor. I, a slightly older but still young, legal secretary. As luck would have it, on this holiday my boyfriend was . . . out to sea. This was a phrase I would become very familiar with over the next 24 years, but at least he was present for the births (and conception!) of our daughters so I’m not complaining! The submarine service is a very close-knit group of sailors and their families. While Jeff was away, I was welcomed with open arms to another family’s home for Thanksgiving. They were like the Brady Bunch. His kids, her kids, their kids, lots of kids. Do I order pie from Marie Calendars? Or do I attempt to make my own? My idea of “homemade” back then consisted of opening a can of pie filling and pouring it into a from-scratch pie shell. To make the filling from scratch was clearly above my pay grade. I’ve come a long way since then . . . The pies I produced were not pretty. When I arrived at the Schonauers’ house, Dale ran out to the car to greet . . . the pies! Apparently, the pies were the guest of honor at this Thanksgiving Day event. I will never forget the combined look of horror and disappointment on his face. And that’s pretty much the last homemade pie crust I made until the Strawberry Rhubarb Pie, which turned out 100 times prettier than my Thanksgiving 1990 pies. No kidding! 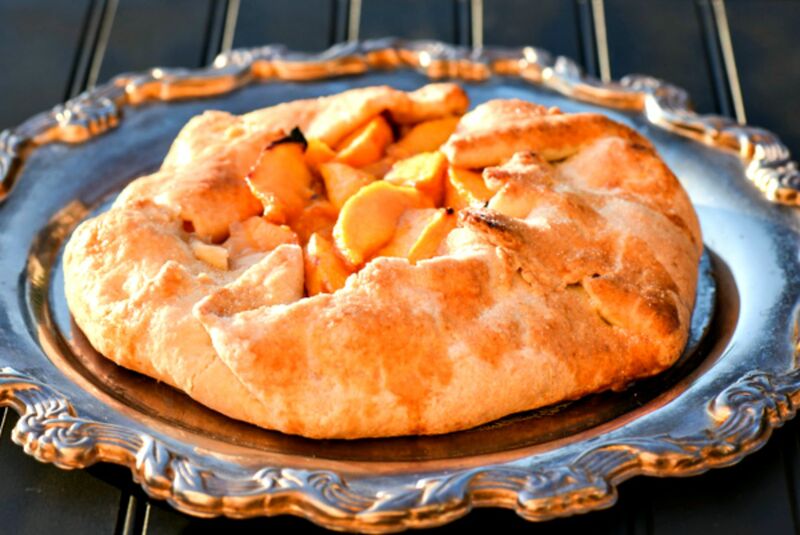 This Rustic Peach Tart is the answer to my prayers! This is a stress-free pie-like-dessert for pie-crust-challenged people like me. “Rustic” is my new favorite adjective! I’m running with it!